A blood clot is basically a collection of blood which changes from its liquid state to being semisolid or gel-like. Clotting is one of the most important procedures that help an individual in preventing the loss of excessive blood in certain circumstances like during an accident or in case of a cut. However, clotting in one of the veins can be dangerous because the accumulated blood is not able to dissolve on its own. Blood clotting in the leg is called DVT or deep vein thrombosis occurring in one of the veins deep within the body. This condition is common in any one of the legs. 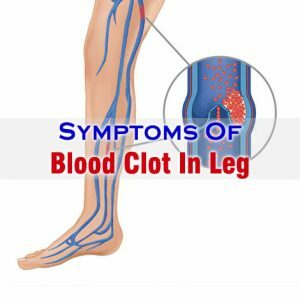 The symptoms of blood clot in legs are commonly observed in people who stand for long hours regularly, and during pregnancy. If the blood clot is immovable, it might not be very dangerous but if it moves then chances are that it can become dangerous. Blood clot can prevent the flow of blood if it breaks and travels to the lungs or the heart through the veins. Pain in the leg which generally starts in the calf and feels like soreness or cramping. The signs of blood clot in leg are very similar to the sign of Charlie Horse or pulled muscle. However, the difference lies in the swelling of the leg and the leg being warm and slightly discolored. Contacting the doctor on an immediate basis is very important for treating these symptoms. This is because treatment for these symptoms is needed right away.